Wearing my new Miista boots! I’m so happy to finally have boots that are gold but still have an edge to them to gently roughen up pretty looks and it’s so nice to have a pair of boots that are different from your every Zara boots and shoes! Love your outfit! Very chic and classic) Amazing gold boots. Great skirt and chic boots! the shirt and the shoes are wonderful! Great combination! You look stunning! JA de schoentjes zijn geweldig! love love your gold boots! Love the pop of gold! you styled the boots amazingly!! ahhh I love this whole outfit SO MUCH! Hele gave outfit! Dat rokje staat je ook goed zeg! I just love the way you styled this leatherish skirt with white shirt! I have a simillar one, but I’m always afraid that I’ll get the school look.. those shoes are just perfect to break the uniform style! Love it !!! I’m beyond obsessed with that black skirt! looking so preety so nice outfit . so nice b,log . love how you paired the leather skirt with the blouse! 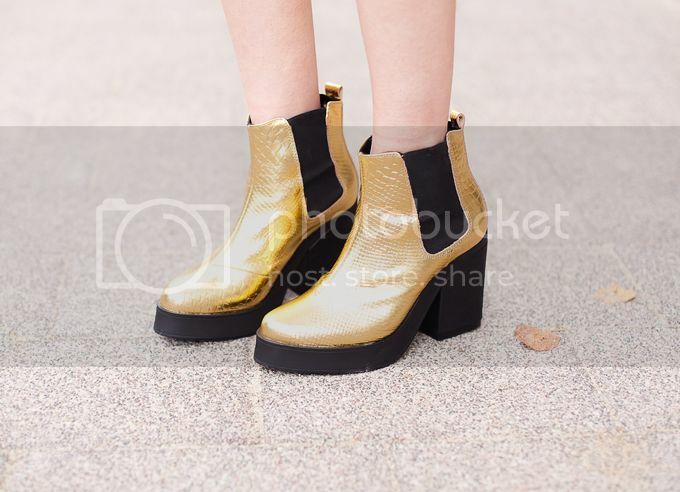 Crazy for your gold booties! Your shoes & coat are amazing. Your new look is just awesome! Thanks for this great post, I loved the exhibition’s instation, I wish I could have seen it!congrats on your blog, really nice! the hairy clutch is such a show-stopper! Great look those boots are to die! Super cute outfit. Those gold boots were made for you.